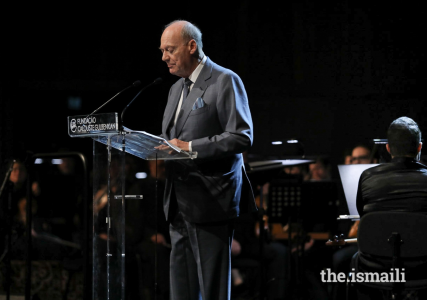 Speech by Prince Amyn Aga Khan at the Aga Khan Music Awards in Lisbon 2019-03-29 | Ismaili.NET - Heritage F.I.E.L.D. This evening’s concert celebrates the inauguration of the Aga Khan Music Awards, established by my brother, His Highness the Aga Khan, to recognise exceptional creativity, promise, and enterprise in music performance, creation, education, preservation and revitalisation and in engendering social inclusion in societies across the world in which Muslims have a significant presence. Portugal is a shining example of a pluralistic society united while remaining conscious of its diversity, historical past and culture, and it is thus fitting that the first Awards and this first ceremony along with the related concerts and events should take place here. I am grateful indeed to the Government of Portugal for its support and to the Calouste Gulbenkian Foundation for providing us their superb facilities for what I think is an exceptional occasion. This happy event is particularly meaningful to me personally, as it represents the actualization of an idea that I first broached to my brother almost two decades ago, when the Aga Khan Trust for Culture was taking its first steps toward the inclusion of music revitalisation in its cultural development portfolio. My idea was to establish a music prize that would aspire toward a level of worldwide visibility and impact in its field analogous to that of the Aga Khan Award for Architecture. Music has always been an art of special importance to me: Its power of communication is special, enormous and universal; it binds people together and unites them. There is an old Sufi aphorism: “If you want to go north, go south.” And that more or less describes the circuitous path that has now led, finally, to the implementation of the Music Awards. It was back in 2001 that my brother launched in Central Asia the Aga Khan Music Initiative, as it was then called, with the aim of helping to preserve and revitalise traditional folk, classical and devotional music in the region. These preservation efforts were very much needed, for many of them had suffered neglect, or active suppression during the Soviet era. As its first project, the Music Initiative created a network of music schools and centres in Afghanistan, Kazakhstan, Kyrgyzstan, and Tajikistan, each supported by a workshop to fabricate high-quality musical instruments for students. In some cases, instruments that had survived only on old recordings or as museum objects had to be reconstructed and reintroduced into practice. In other cases, local musical instruments that had come to be regarded as old-fashioned and undesirable were rehabilitated and repopularized through the teaching and mentoring activities of outstanding master musicians. Little by little, the young musicians who spent their after-school hours learning to play these instruments in the Music Initiative’s schools and centres found themselves in demand as performers and teachers. In 2003, when the first schools opened, we committed ourselves to a long-term investment in educating and developing the careers of the next generation of musical and cultural leaders in Central Asia. That commitment was met with scepticism in some quarters, but 15 years later, when we evaluated the results of our interventions, we found compelling evidence that our strategy had led to the results we’d envisioned. In making, in playing music, the children learn how to learn. The role in education that museums of musical instruments can play should not be under-estimated. The Aga Khan Music Awards are expected to fill a unique cultural role. Among the world’s many music prizes, none as far as I know currently focuses on the full spectrum of devotional music and poetry, indigenous classical music, traditional folk music, and tradition-inspired contemporary music which has flourished and which we would like to see continue to flourish in cultures shaped by Islam. These musical genres and styles remain important in today’s world as they embody music’s traditional role as a source of spiritual enlightenment, moral inspiration, and social cohesion. At a time when strengthening tolerance and pluralism has become an acute worldwide priority, music is one of the arts which offers a medium for reaching, involving and uniting global audiences by engendering emotions which we all share as human beings. I once said that music is made of dreams and the echo of dreams and I believe mankind shares the same dreams in large measure. Not only does this evening’s concert celebrate the inauguration of the Music Awards; it also marks the debut of a collaboration between the Gulbenkian Orchestra and the Master Musicians of the Aga Khan Music Initiative. Their programme, developed specifically for this occasion, showcases the eclectic creativity of the Master Musicians, a group of cosmopolitan performer-composer-improvisers whose lives and careers have zigzagged between continents and among engagements with classical, folk, jazz, and contemporary concert music from around the world. I hope this music tonight will engage you emotionally and almost physically, as if you were attending a jam session. The compositions by the Master Musicians that we will hear were arranged for the Gulbenkian Orchestra by Dmitri Yanov-Yanovsky, who lives in Tashkent in Uzbekistan and who is an admired composer in his own right, and who has been a long-time collaborator of the Aga Khan Music Initiative. As we all know, orchestral representations of rhythms and melodies that were inspired by music and legends from the Middle East and Central Asia were present in much nineteenth-century music. One thinks of Rimsky-Korsakov and Borodin for example. It was a time when orientalist painting also reflected new interest and the excitement caused by an increased presence of Westerners in the East and new discoveries. Tonight, however, we have musicians from Afghanistan, Tajikistan, Uzbekistan, and Syria forming an orchestra to play their compositions which come from their own upbringing and traditions and which are played on their own musical instruments. The movement has been reversed: Instead of music which is trying to sound what the audience would think of as oriental, we are moving toward a music emanating directly from the East but including western elements and even in time with perhaps western instruments. From what risked being pastiche, we are moving toward a new, broader inclusive music that respects and includes different traditions, different sounds, different rhythms. A new, inclusive language. Music is, by definition, an evolutionary art, and musical composition has always evolved. Men have always travelled and have always taken their music with them, modifying and transforming their traditional music as they heard the music of the people they met. This is the kind of adventurous artistic collaboration which reflects the pluralism that His Highness, together with the Aga Khan Trust for Culture and our entire community, have worked and are working to build and support. It is our hope and aspiration for the Aga Khan Music Awards that they should serve as a catalyst for many future projects that draw on the rich tapestry of Muslim musical heritage while reaching across the boundaries of time, place, and culture, assimilating the traditions and characteristics of other heritages into a global pluralistic sound. Musicians are irrepressible innovators for they implicitly understand that music must evolve to remain alive and culturally relevant. The institutions that stimulate, curate, commission and manage the production and dissemination of music must therefore also evolve and change. Both our Aga Khan Music Initiative and the Music Awards are no doubt no exceptions. Both are works in progress in the best sense. I hope you will join me in wishing them long life and continued productivity in the years and decades ahead.